Nepal, flattened by the 7.9 magnitude earthquake, has stopped looking for the dead. As heavy machineries scoop out the ruins, the tiny Himalayan country awakes to an unbearable future. Millions of people have to be immediately sheltered and many areas have to be built afresh. The cost of rehabilitation is estimated at $5 billion or one-fourth of the country’s GDP. Aftershocks continue to traumatise the country already in distress. For those who survived, the transition to a normal life is going to be painfully long and difficult, given the country’s capacity to handle such a disaster. Five days after the earthquake shook Nepal on April 25, Nima Lama, a resident of Chum village in Gorkha district, was still trying to get a letter from the authorities permitting a helicopter to carry rescue material to his village. The epicentre of the earthquke, Barpak village in Gorkha, is very close to Lama’s home. Lama was in Kathmandu when the earthquake struck. He rushed to his village with great difficulty. “It is almost impossible to reach there on foot as all roads to the village have collapsed,” he said over the phone. “My village is completely destroyed.” His family is safe, but without food or water. “Government officials are mainly active in accessible areas, and there is no coordination among them for rescue work,” he added. Others in Nepal echo Lama’s concerns. “There is absolutely no coordination among government agencies, except the security forces. The government mechanism has been a total failure in this disaster,” says a doctor who does not wish to be named. At the time of going to press, the death toll was 7,765, while the number of injured was 15,911, according to the Nepal police. Most deaths have been recorded in Sindhupalchowk, Kathmandu and Nuwakot. The toll would have been much higher had it been a weekday—most school buildings in 11 districts collapsed. Once a city of four million people, Kathmandu today wears a deserted look. People have left the capital city in large numbers, unsettled by aftershocks and fearing another big tremor. According to the National Seismology Centre (NSC), Kathmandu, Nepal continued to witness strong aftershocks for days after the first big jolt. “It was like tearing a bamboo; the first hit was very loud, then it went from west to east and the aftershocks are slowing down,” says Som Nath Sapkota, deputy director general of the Department of Mines and Geology, which runs NSC. Many have flocked to their villages to check on their families. Santosh, who sells paan (betelnut leaf) on the streets of Kathmandu, is under pressure from his parents to go back to his village in Dhanusa district, as they do not want to see their only son dead. “They have heard that there will be an outbreak of diseases in the city, so they have been calling me home,” he says. The base camp at Mount Everest was another site of disaster as the quake triggered an avalanche, burying 19 people in the snow and injuring many. The avalanche also killed at least 67 mountaineers who were trekking at the time of the earthquake. The United Nations has made an urgent appeal to member states to donate US $415 million to provide relief material—tents, water, blankets and medicines—to at least half a million people who have been living in the open since April 25. Most buildings have crumbled to dust. Till May 7, at least 288,798 houses were completely destroyed, while 254,112 houses were partially damaged across the country, according to the National Emergency Operations Centre under the Nepal government’s Ministry of Home Affairs. More than 10,700 government buildings have collapsed. Lax building regulations and safety standards have been blamed for the high number of deaths. Sushil Kafle, a resident of Dhumbarahi apartments in Kathmandu, one of the few apartments that survived the quake, says, “Ours were among the first apartments to be built in the city so there was a lot of monitoring by the municipal corporation. But the condition of newly constructed high-rise buildings is not very good as they were never checked.” Sirjna K C, a resident of Chandol, explains how difficult it is to build a quake-resistant home in Nepal. “To ensure that safety standards were followed in my home, I had to bribe municipal officials to come to inspect my house,” she says. Historical monuments were also damaged. Kathmandu Durbar Square, a UNESCO World Heritage Site, collapsed, as did the nine-storey Dharahara Tower, built in 1832. Many temples, including the 17th century Pashupatinath Temple, another World Heritage Site, have been affected. The “Gorkha earthquake”, as termed by seismologists, has once again triggered a debate among scientists on the vulnerability of the Himalayas to earthquakes. “The Himalayan range stretches 2,500 km from Afghanistan to Myanmar. There is a regular movement of the fault line that runs along Nepal’s southern border, where the Indian tectonic plate collided with the Eurasian plate 40-50 million years ago,” Sapkota explains. An earthquake of a powerful magnitude was imminent in the highly seismic Himalayan zone, where Nepal is situated. But do we know enough about the geology of the youngest mountain range? Research has been on to better understand the seismicity of the Himalayas. Can such research help us design technology to predict earthquakes and prevent a Nepal-like disaster? The EARTHQUAKE of April 25 and a series of aftershocks have damaged about 14 hydropower plants across Nepal, resulting in a loss of 150 megawatt (MW) of electricity. Sher Singh Bhat, deputy managing director, Nepal Electricity Authority (NEA), said in a press briefing in Kathmandu that the Sunkoshi hydropower plant has suffered serious damage—its 3-km canal has multiple leakages. The power plant had already suffered damage during a landslide last year. "It can start operation only after three-four months," Bhat added. Other hydropower plants have also been damaged and will require maintenance. NEA officials hope to restore Trishuli and Devighat power plants within a week. The challenge, they say, is shortage of labourers. None of the ongoing projects, except Upper Trishuli 3A, has suffered physical damage. "About 3 km access road of this project has been washed away by landslides triggered by the quake," Bhat says. 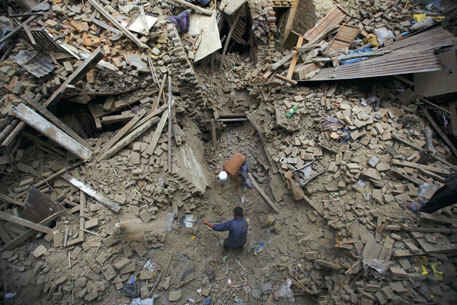 Others that suffered damages include Kulekhani and Upper Bhotekoshi hydropower plants. How well do scientists understand the seismicity of the Himalayas? What makes the Himalayan region a hotbed of seismic activities? 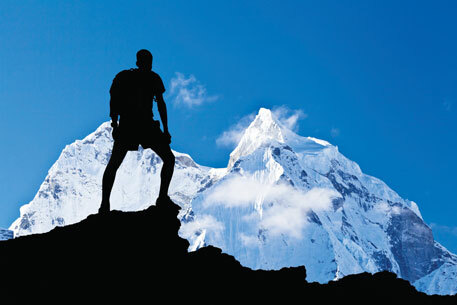 The answer lies in the processes which led to the formation of the mountain range. The youngest range in the world, the Himalayas were formed due to the collision of the Indian plate with the Eurasian plate 40-50 million years ago. The Indian plate has been sliding under the Eurasian plate ever since. And this process is not over. The contact surface between the two plates is where pressure builds up and causes major earthquakes. This is exactly where Nepal is located. But why was the earthquake so destructive this time? There are two reasons for this. First, the epicentre was just 15 km below the surface and this amplified the impact. Some previous earthquakes in the same area have had epicentres as deep as 200 km. Second is the location of Kathmandu, one of the worst-affected areas. Just 140 km from the epicentre, Kathmandu sits atop a lake basin. Over the ages, the basin got filled with more than 600 m of soft sediment. When a seismic wave passes through a layer of sediment, it makes the sediment behave like jelly. The process is called soil liquefaction. Earthquake waves travel at a high velocity through the stiff, crystalline rock of the crust but slow down dramatically when they enter the basin. This increases their amplitude and causes stronger tremors. In addition, the sharp contrast in the densities of the softsediment in the basin and the rocks that surround it can cause the waves to reflect, trapping energy in the basin for a longer period. This extends the duration of shaking. Though the Himalayas are prone to seismic activity, there is very little information on earthquakes that occur in the region. Most of what is known has emerged in the past 20 years, after the development of GPS technology which made exact measurement of plate movement possible. It is now known that the plates move around 45 mm a year. Of this, around 18-20 mm shift is accommodated by the thrusting of the Indian plate beneath the Himalayan belt. Due to this, the Himalayas advance over India by about 2 m each century and the Indian plate disappears by an equal distance beneath Tibet. “There is friction between these two plates and they stick to each other. The down-going Indian plate tries to drag the overlying plate and after some time, say tens or hundreds of years, when the stress due to the movement of plates exceeds the frictional strength, the two plates suddenly get unlocked. That’s when you have major earthquakes,” explains Vineet K Gahalaut, geologist at Hyderabad-based National Geophysical Research Institute. This theory of strain build-up and release during an earthquake has been known for some time but there was little evidence to substantiate it. This missing piece of evidence in the jigsaw has been provided by the Nepal earthquake, says Supriyo Mitra, associate professor at the department of earth sciences, Indian Institute of Science Education and Research, Kolkata. “We now know that the Nepal earthquake ruptured an approximately 150 km by 70 km area of the locked surface of the Himalayan front, lurching the whole block forward by over 10 m on the Indian plane, with Kathmandu sitting on top of it. This knowledge could be useful for further studies as a bigger earthquake is likely in the area,” says V K Gaur, honorary scientist at the Council for Scientific and Industrial Research’s Fourth Paradigm Institute, Bengaluru. The magnitude of the earthquake depends on the amount of the slip the plates undergo. Till a major earthquake actually occurs, scientists refer to regions of accumulated potential slip as seismic gap (see ‘Mapping the gaps’). Seismic gaps are prone to earthquakes because the accumulated strain beneath the surface has not been released. 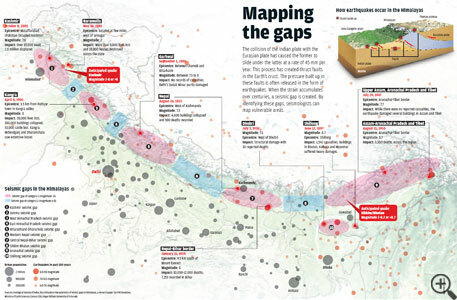 “We know that there are a number of seismic gaps, each spanning 200 km or more, in the Himalayas which can produce earthquakes of greater than 7.5 magnitude,” says Gaur. For example, the region to the west of the present Nepal earthquake has an accumulated potential slip of approximately 9 m, while the accumulated potential slip in the region to its east is approximately 1.5 m. Though we do not know when these earthquakes will occur, we can say that if it were to happen today, and if it released the entire stored energy, it will be an earthquake of magnitude more than 8 on the Richter scale. “We have a fairly accurate knowledge of the current level of pent up energy along these seismic gaps, but we do not know the strength of the frictional locking at the Himalaya-Indian plate because it is very variable. It is this strength that decides how much strain a given segment can bear without breaking,” says Gaur. Therefore, it is difficult to predict an earthquake. According to Eric Kirby, geologist at Oregon State University, USA, GPS monitoring and geological studies suggest it would take scores of magnitude 7 quakes to accommodate all of the plate motion, but only a handful of mid-size, magnitude 8 quakes, or just one of magnitude 9. The energy released by a quake increases by a factor of 30 with each additional point in magnitude and would lead to great devastation. People residing in seismically active areas should always be prepared for major earthquakes, says L S Chan, professor at the department of earth sciences, University of Hong Kong. There is no evidence that the energy is being dissipated through aseismic means (mechanisms other than earthquakes) and earthquakes will eventually recur in such areas, he says. The understanding on India's vulnerability to earthquakes has developed only in the past 20 years. This can be attributed to advances in three fields of study: (a) seismological observations and modeling of Himalayan earthquakes; (b) geological observations of fault zones and timing the rupture of these faults using isotope dating techniques; and, (c) global positioning system-based geodesy studies which measure the deformation of the surface at very high precision (millimetre scale resolution) using satellite data. From seismological studies, we know that earthquakes always occur in brittle rocks and rupture due to frictional failure. From geological and geophysical evidences we know that 40-50 million years ago, the Indian plate collided with the Eurasian plate and initiated the formation of the Himalayas. These studies also helped in understanding the behaviour of rocks under different temperature and pressure conditions. The study of GPS geodesy in India began in the 1990s to quantify the convergence of the Indian plate with Tibet and the deformation associated with it. H N Srivastava, emeritus scientist at the Council for Scientific and Industrial Research and former additional director general of the Indian Meteorology Department, also puts Uttarakhand in the high-risk category, but says that instead of a single 700 km seismic gap, the Himalayan arc can be divided into 10 seismic gaps. In a paper published in Geomatics, Natural Hazards and Risk in 2013, the team made two categories of seismic gaps on the basis of the historical seismicity of the area. Category 1 seismic gaps are classified as those where earthquakes of magnitude 8 or greater occurred and can recur, while category 2 seismic gaps could experience earthquakes of magnitude less than 8. But the key puzzle of when will these earthquakes occur remains unsolved. The Nepal earthquake has actually raised several important questions. For example, if the region to the west of the earthquake has a potential slip accumulation of around 9 m, while the region that witnessed the quake has a potential slip accumulation of only around 3.3 m, why did the earthquake not occur in the region where the slip accumulation was more? asks Mitra. He says that to answer such questions we need to know how faults cause an earthquake, how active faults interact and whether an earthquake in the Himalayas can trigger an adjacent fault to cause another earthquake. These questions are topics of ongoing research and we do not have conclusive answers, he says. along these segments. But none of this is being done, he says. “In fact, Indian seismologists have shown a tendency to opt for less challenging problems and distract attention from zones prone to major earthquakes to zones which witness moderate earthquakes. The Indian government has been persuaded to sink hundreds of crores of rupees in drilling a deep hole at Koyna in Maharashtra which is the site of moderate seismic hazard. The Koyna experiment is unlikely to shed light on the mechanism of the Himalayan earthquakes,” Gaur says. According to Harsh Gupta, seismologist and former secretary at the Ministry of Earth Sciences, the problem of understanding earthquakes is not limited to India. Even Japan could not accurately measure the susceptibility of the region which witnessed the Fukushima earthquake in 2011. The maximum magnitude predicted for an earthquake in the region was 8 on the Richter scale, but the Fukushima quake which caused the unprecedented tsunami measured 9. Gahalaut says we only have a broad understanding of earthquakes. It is not understood what happens just before an earthquake. Developing such understanding will help in identifying precursors to an earthquake and formulate methods to predict earthquakes. Another issue is lack of historical records of earthquakes. “We want to know when was the last major or great earthquake in this region, its size, its rupture,” he says. There is also a need to increase regional cooperation among the countries in the Himalayan region—India, Pakistan, China, Bhutan and Nepal. “Earthquakes do not respect international borders,” he adds. Apart from geological theories, some scientists also hold anthropogenic factors responsible for earthquakes. Bill McGuire, professor emeritus, geophysical and climate hazards, University College London, is of the view that climate change can affect the structure of the earth. Evidence from the Ice Age indicates that seismic faults are sensitive to small changes in pressure caused by the weight of ice and water on land. This makes it likely that effects of climate change such as melting of ice, rise in sea-level and floods would change the distribution of weight on the planet. McGuire has written a book, Waking the Giant: How a Changing Climate Triggers Earthquakes, Tsunamis and Volcanoes, on the topic, which was published in 2012. A 2008 research led by French geologist Pierre Bettinelli explains how this could be working. His team used a decade of data from GPS receivers and satellite measurements of land-water storage to connect the winter season with the frequency of earthquakes along the Himalayan front. The team then analysed around 10,000 earthquakes in the Himalayas and found that there were twice as many earthquakes during the winter months—December through February—as during the summer. In the Himalayas, monsoon rains swell the rivers of the Ganga basin, increasing the pressure bearing down on the land. After the rains, the riverwater soaks into the ground and the built-up load eases outwards with the flow of the rivers/streams, towards the front of the range. This outward redistribution of stress triggers earthquakes in winters. The findings were published in 2008 in the journal Earth and Planetary Science Letters. There is another theory that links dams to earthquakes. Globally, there are over 100 identified cases of earthquakes that scientists say were triggered by reservoirs, according to a report on the website of Rivers International, a global network of ngos and experts. The most severe one may be the 7.9 magnitude Sichuan earthquake in May 2008 which killed 80,000 people and has been linked to the construction of the Zipingpu dam on the Min river. Experts explain that the extra pressure created on micro-cracks and fissures in the ground under and near a reservoir can lead to earthquakes. The dam was just 500 m from the fault that failed and 5.5 km from the quake’s epicentre. However, most experts disagree with theories that blame human-made factors for inducing earthquakes.“Weather, rain or snowfall do not seem to contribute towards the occurrence of great earthquakes. They do cause annual variations in the plate movement and have been seen to cause small magnitude seismicity but not a large one,” Gahalaut says. As researchers work to understand earthquakes and develop capacity to make accurate predictions, there is a lot that can be done to minimise the destruction. Japan, which has the most advanced earthquake prediction system in the world, can predict quakes only few seconds before they arrive. The Japanese, therefore, construct buildings which are resistant to earthquakes. This is the only way to prevent damage to life and property. About a decade ago, IIT-Roorkee started a long-term project for gathering data using ground motion monitoring equipment in the Himalayas. But the Ministry of Earth Sciences (MoES), which funded the project, transferred it to its own lab in 2014. Since they did not begin to monitor the sensors, no data from the Nepal earthquake could be recorded. At a time when there is a concentrated global effort to better understand the movements of the plates, and accumulation and release of strains, such incidents show governmental apathy, says V K Gaur, honorary scientist at Bengaluru's CSIR Fourth Paradigm Institute. However, Harsh K Gupta, former secretary, MoES, says that the ministry has several projects in the Himalayan region. It has set-up multi-parametric laboratories in critical areas in the Himalayas to observe geophysical parameters and precursors to earthquakes. Additionally, under a very popular programme, many schools in the Himalayan region have been provided with seismological labs so that students can see earthquakes being recorded and analysed. MoES also plans to install Earthquake Early Warning system in a critical location in the Kumaun region, he adds. There are other government institutes in the country where earthquake research is being done. In Hyderabad-based National Geophysical Research Institute, researchers are doing different seismological, geodetic and paleoseismological studies to assess the seismic hazard of the region. "We have several observatories in the Himalayan region," says V K Gahalaut, geologist at the institute. At CSIR Fourth Paradigm Institute, scientists are engaged in evaluating hazard potential of habitats located on softer soils, such as the Kashmir valley. There are also plans to study the accumulation of strains in the Himalayas, says Gaur. However, the quality of these research projects will be proved only when the results are released. About 80 per cent of India’s population resides in regions that are vulnerable to earthquakes of moderate to extreme intensity. If an earthquake of a magnitude as strong as the Nepal earthquake occurs in India, will our buildings survive? 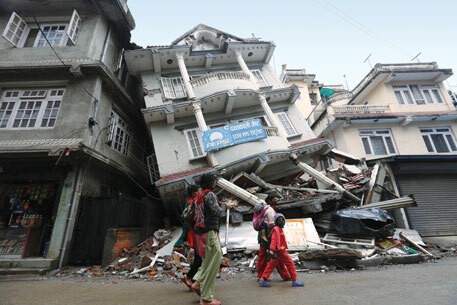 Last year, a report by the National Disaster Management Authority had pointed out that 95 per cent of deaths during past earthquakes in India have mainly been due to the collapse of poorly engineered buildings and structures. This calls for a reflection on the nature of the country’s buildings and construction practice, and whether they can survive earthquakes with little or no damage. India has commendably improved its post-disaster response and management capacity, as was observed in the rescue and relief mission in Nepal. But it is yet to strengthen its infrastructure to withstand earthquakes. “Pre-disaster preparedness is a big area for intervention. We are systemically building our capacity for this, but there is still a lot to achieve,” says Santosh Kumar, executive director, National Institute of Disaster Management (NIDM), New Delhi. In 2006, the government-appointed Tejinder Khanna Committee found that 70-80 per cent of buildings in Delhi violate building and development control regulations. Other cities are not better off. “Just a fraction of cities and towns in India take into account National Building Code (NBC) and other building regulations,” says Anup Karanth, public safety and risk management specialist in Delhi. Buildings need to be designed with safety features to withstand earthquakes. 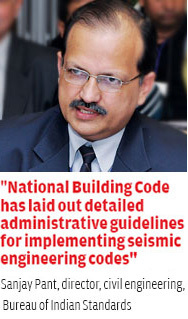 The Bureau of Indian Standards (BIS) prescribes seismic codes that help engineer such buildings. 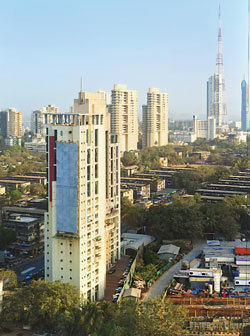 Popular perception is that a skyscraper would be more dangerous than a shorter building during an earthquake. But both are equally vulnerable if not engineered properly. Ground-shaking is a natural phenomenon, and buildings are expected to be engineered to withstand this. Taller structures are more flexible. They absorb earthquake vibrations by distributing them along their height. This lowers, but does not eliminate, the impact of the quake. In case of shorter buildings, the force of the earthquake gets concentrated due to lack of height to dissipate the energy, often resulting in collapse. “Codes have been frequently revised and cover all kinds of construction technology and building typology,” says Sanjay Pant, director of civil engineering at BIS.“NBC has even laid out detailed administrative guidelines for implementing these codes,” he adds. The ground below a structure is as important as the design and engineering of the building. Bedrock is better at absorbing shockwaves than sandy soils or landfills. So buildings on solid rock will be much less affected than those built on softer soil or reclaimed land. Further, if softer soil has water, it will be prone to liquefaction—a phenomenon where the ground becomes a little like quicksand—during an earthquake. Buildings on top of liquefied soil usually sink and often topple. Development control regulations formulated by the government address these vulnerability issues, but these regulations are not strictly adhered to in India. The urban local bodies are responsible for checking compliance to NBC and development control regulations at multiple stages—first at the design stage of the building, then during its construction and finally at the time of completion before granting occupancy certificate. But the guidelines are blatantly violated, either because the urban local bodies are understaffed or underqualified. “The building’s structural design is hardly checked by government authorities, especially in the case of residential units, while the construction, too, happens more or less unchecked. Such loopholes make way for deficiencies, such as poor strength of concrete, use of improper material and improper method of construction,” Karanth says. While it is the responsibility of structural engineers to check building designs at the municipal level, their availability is a challenge as most of them are absorbed in medium and large construction firms. 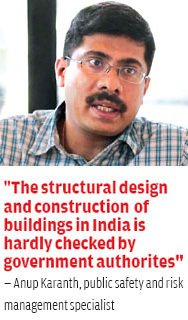 “Civil engineering is a stepping stone to specialisation in structural engineering, but seismic design is hardly covered in the civil engineering curriculum,” says Mahesh Tandon, president, Indian Association of Structural Engineers. The seriousness of the problem was demonstrated during a building collapse in November 2010 at Lalita Park in east Delhi’s Lakshmi Nagar, in which more than 60 people died. Following this tragedy, the Delhi government issued an order in April 2011 making it mandatory for all builders to submit sanctioned building plans along with structural safety certificates for their new buildings. Within days, the number of applications for property registration saw a drastic fall. Ten days later, the Municipal Corporation of Delhi informed the government that it did not have enough structural engineers to issue the certificates. The order was revoked. Accountability is another problem. “Today structural safety certificates are bought and sold and there is no cross-checking of their authenticity. 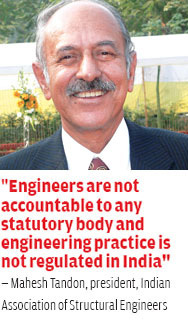 There is no statutory body in place to regulate engineering practice,” Tandon adds. Such administrative loopholes in the approval and construction of buildings can spell disaster whenever the country is rocked by a major earthquake. So, what is the way ahead? Seismic codes have been in place since 1962. But the collapse of more than 200,000 houses in the Bhuj earthquake made the government realise that the codes were lenient. BIS revised them in 2002 to meet stronger seismic threats. This revision implied that India’s buildings constructed before 2002 are not strong enough to withstand earthquakes and require retrofitting. NIDM is preparing a possible retrofitting roadmap for India. “The main challenge is the time needed for retrofitting. Providing adequate housing to people while their buildings undergo retrofitting is challenging,” Kumar says. Cost of retrofitting can also be very high. Pant adds that it is often cheaper to demolish a complete structure and rebuild it to withstand earthquakes than undertake retrofitting. But such expenditure is non-negotiable as the safety of occupants is at stake. Take New Zealand, for example. After a 6.3 magnitude earthquake killed 185 people in Christchurch in February 2011, buildings are being retrofitted to reduce vulnerability. New Zealand also mandates unsafe buildings to display warning notice. A similar order was issued by the Supreme Court of India in December 2014 seeking all buildings that house more than 100 people to display their earthquake resistance status. But there is no clarity on who is responsible for its implementation. In the absence of administrative action, public participation becomes crucial. But how would a resident know if his or her building needs retrofitting? “Any building built or designed before 2002 and/or located on reclaimed land or floodplains should consult a registered structural engineer or an experienced civil engineer,” Tandon says. People can also learn some basic visual screening to determine seismic defects. There are simple things that people can check for (see ‘Can your home resist a quake?’). In case of masonry structures, the buildings must have continuous concrete bands connecting all doors and windows at lintel and sill levels. Also, the total width of all the openings in any wall must not be more than half the total length of the wall. In case of reinforced concrete structures that are multi-storey, presence of soft storeys—any floor with only pillars and no walls—is dangerous. People should ensure that extensions to buildings are done with proper engineering inputs. Another challenge is that poor people’s homes are not included in the government’s plan of action for disaster preparedness. Currently, there seems to be no strategy in place to deal with the aftermath of a disastrous earthquake. “Since implementation of seismic codes is difficult to monitor, awareness campaigns should be the long-term approach. It should be coupled with the certification of building artisans and training and upgradation of their skills and knowledge,” says Rajendra Desai, managing trustee and joint director, National Centre for People’s Action in Disaster Preparedness, an Ahmedabad-based non-profit. 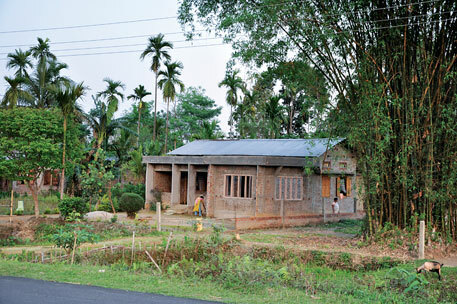 Karanth maintains that important institutions—hospitals, police stations, fire stations, sewage and water treatment plants, community halls, schools, libraries, government offices and utility companies dealing with electricity, power and gas—should be immediately assessed and retrofitted for seismic safety on a priority basis. “Rapid Visual Screening of elevated urban infrastructure like bridges, flyovers and metro lines should be undertaken every six months and a detailed inspection carried out every three to five years,” Tandon suggests. How an earthquake will affect a city has a lot to do with how its citizens and governments have engineered buildings and civic infrastructure. Lessons can be drawn from cities like Tokyo and San Francisco, which frequently battle shaking grounds with their quake-resilient engineering. 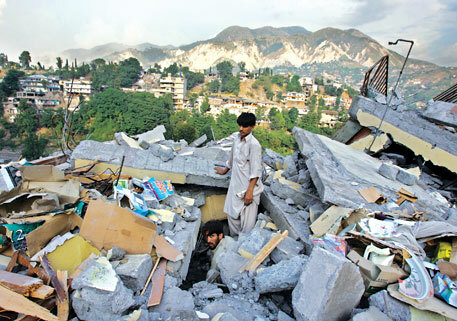 Administrative intervention could not prevent 450,000 houses from collapsing during the Kashmir earthquake in 2005. The numbers can reach millions if an earthquake hits a more densely populated region such as the seismically vulnerable Indo-Gangetic plains. The government should put in place a mission framework which can fasttrack and absorb the massive cost required for improving the seismic performance of our structures. Earthquakes cannot be stopped, but casualties and economic damage can be averted by acting wisely, and now. Buildings MADE through traditional construction techniques have shown remarkable resilience during various Himalayan earthquakes. Superior seismic performance of both Ikra (Assam-type houses) of the northeastern states and Dhajji Dewari of Kashmir valley is well documented. An important aspect of these housing types is the joinery among various elements such as posts, wall panels and roof trusses. In Ikra, all panels are made of bamboo frames, which are filled with the shoots of the Ikra reed. The shoots are plastered from either side with a mud-dung mixture. In the Dhajji Dewari technique, a framework of timber is made which is filled with bricks or stones. This creates a patchwork of small panels made up of bricks surrounded by timber elements. The presence of timber or bamboo studs gives a sturdy framework and divides the wall into small sections. This fragmentation distributes the energy of an earthquake equally across these types of walls, reducing its impact. This prevents damage to the wall.